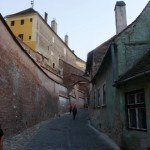 Historic Sibiu is a charming gem in the Transylvania region of Romania, a 2007 European City of Culture filled with colorful homes and buildings protected through the centuries by three fortified walls. Not much of the ancient walls remain – here is a stretch with three towers, each one named for a guild of the city. 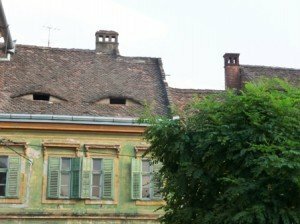 Eyes peek out from the rooftops, the eyelid vents an ancient feature that allowed air to circulate in the attics where the famed local sausages hung to dry. The historical town is arranged around two squares, the Big and the Little Ring. In the center, the curve of the inner walls can be clearly seen as we cross a bridge and stroll a quiet lane. What a pleasant town – there’s much more to discover within the walls as well as in the surrounding countryside. 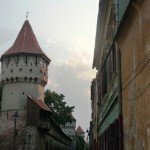 It would be a perfect stopping place for Slow Travelers to discover the intriguing country of Romania. 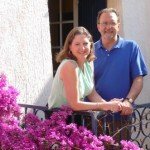 We’ve visited Europe more times than we can count, learned some entertaining stories there, and met some warm and helpful people who also enjoy the wonders of music and life in Europe.We look forward to sharing these stories and friends and experiences with our Music and Markets guests.